In 2012, Mariposa was sentenced to fifteen months in solitary confinement. Through letters with longtime friend and current collaborator, Julia Steele Allen, Mariposa brings her experiences to the stage. The Premier performance of Mariposa & the Saint was held in New York City in December of 2014. The play is now touring nationally. The following description was taken from an article written by Andrea Denhoed and first seen in The New Yorker. The two women met in 2005—Fonseca was serving a twelve-year sentence, and Allen had been a prison-reform activist since the nineties. Her time spent volunteering with the California Coalition for Women Prisoners as a freshman at U.C. Santa Cruz led her to drop out of college and dedicate herself to activism full-time. The process of the writing is folded into the action of the (almost) one-woman show. “I want you to know that this letter you just sent me really got my juices flowing,” Mariposa says. “I felt like we were in the same room bouncing ideas off each other! I like the thought of one actor ’cause it seems like people might be able to connect better, but, I was thinking, also? Maybe once in a while a person dressed as a C.O. could walk by. But they would have to have their face covered in a black hood or something, so you never saw the face. Just like a moving piece of scenery, a representation of this faceless machine.” And the guard is there, although with a white, featureless mask, with only his eyes peering through, always straight ahead. He doesn’t have any lines, but mostly sits in a chair on the side of the stage, so that you almost forget that he’s there until he walks across silently, in heavy boots. Or, sometimes, he stands by Mariposa’s cell (which is made of fabric blocks and starts out tiny and cramped, but expands and changes as she tells her story) and makes a loud thwacking sound by hitting the back of one hand against the other, then conducts a body search and passes a phantom meal into the cell. (The hand-slapping mimics a wordless code that guards use to communicate with inmates, hitting their sticks on the cell doors.) The interruptions go more or less unremarked on by Mariposa. Mariposa says that she never really went to school, and taught herself to read while incarcerated, by memorizing long stretches of the dictionary. But Fonseca’s writing is raw and accessible, and she portrays herself killing time by trying to shout through the vents at other inmates, or singing and dancing, between stretches of her backstory, which is grindingly difficult and traumatic. Allen is tall and strapping, with blond hair that is shaved on the sides. She plays Mariposa with a chin-out defiance that can occasionally tip into being overly strident—a play about isolation might do well with more too-long pauses. But it is not really the writing, story, or performance that are primarily responsible for the play’s unusual frisson but rather the sense of impossible proximity to a real person in what is, for many, an unreal situation—that the play is not about being in solitary, but a dispatch from the lived experience of being there. The audience is told at the beginning of “Mariposa and the Saint” about the violation that landed Mariposa in the Solitary Housing Unit, or SHU(pronounced “shoe” as viewers of “Orange Is the New Black” will know): she was found in possession of tweezers, “a class-A weapon.” There’s a much longer wait to discover what crime sent her to prison in the first place. To get there, we go through her family, her childhood, her own children, her financial situation, her psychological deterioration after a long period in solitary—which leaves her shaky, confused, and desperate—and by the time we arrive at the crime, the idea of weighing the degree of her guilt and the concept of “deserving it” seem beside the point. 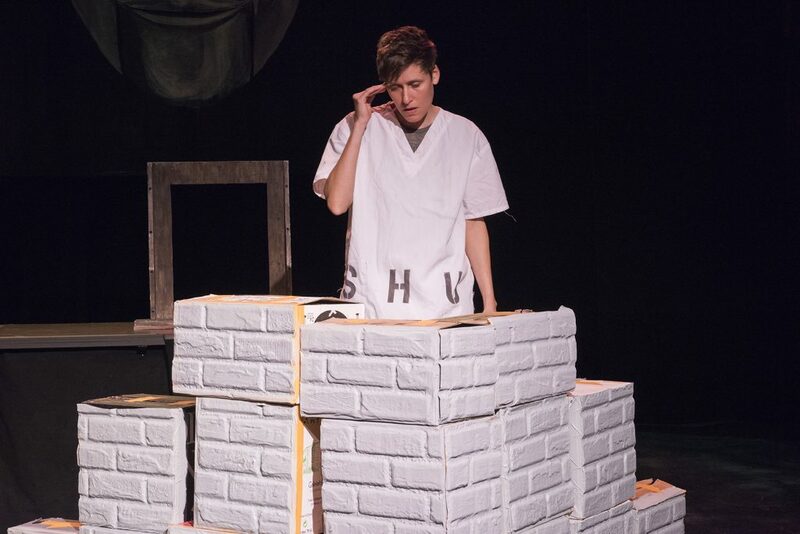 The play presents solitary confinement as a particularly egregious failure on the part of the prison system to approach prisoners—not just the good and the innocent but also the guilty and the bad—as complete human beings, as though some transgressions can reduce people to symbols of guilt, to be punished. It throws the definition of “inhumane” into relief. Toward the end of the play, just before Mariposa is scheduled to be released from solitary, she is sentenced to another year in the SHU, because of a complicated technicality arising from the constant shuffling around of inmates in California’s overcrowded prisons. This elicited an audible gasp from the audience, which I think had less to do with the particulars of Mariposa’s story as it did with the experience of having sat in contemplation of indefinite isolation. Fonseca is still incarcerated, currently in a psych unit. (Psychological problems often crop up during, or are exacerbated by, long stints in solitary.) At the end of the show, audience members are offered pre-addressed postcards that they could use to write to her. It’s a bit of a shock to think that communicating with Fonseca could be as easy as that. It’s one thing to be reminded that people somewhere are suffering, but it can be hard to comprehend the fact that those people exist in the same dimension that we do, and might have something to do with us. There was a point early in the play when Mariposa sat on the edge of the stage and said, “A question I have for the normal. You said I could ask them anything, right? If you were suddenly ripped from your life, with no access to the world, nothing, no one to help you—what would you mourn? What would you ache for? You can answer.” Requests for audience participation usually elicit a charged silence, but this one seemed to bring extra static into the room because the actor onstage was an avatar for a live person who was really asking these questions in a small room, far away, and who was someone that you might actually talk to.